If you like a USB charger that you can take on a trip then check out this useful USB home and car charger. The charger has 2 USB ports that can charge your device at 2.4A. 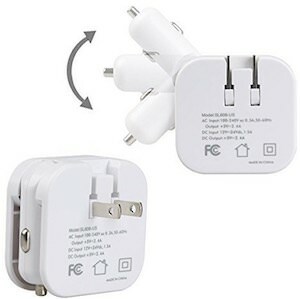 And this is not just any USB charger this is one you can use in your home and in the car as it has the normal power plug that you use at home but it also has the 12volt plug that you can use in the car and both connectors fold down so that they only come out when you need it. A USB charger like this is really useful in your travel bag because then you have USB power in your rental car and hotel room so come check out this USB Home And Car Charger.